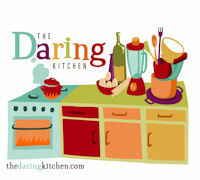 Time for this month's Daring Bakers' challenge. Host Jenny of Jenny Bakes presented us with an easy challenge - cheesecake. She gave us the freedom to do any flavor cheesecake and any kind of crust as long as we used the recipe she gave us as the starting point. The recipe comes from Jenny's friend Abbey. Abbey's recipe was very similar to the recipe that I've been using for years. My batter is made with three sticks (24 ounces) of cream cheese, 3 large eggs, 1 cup of sugar, and a little heavy cream and/or butter. Any number of flavors can be added to the batter and, over the last 15 years, I have tried many combinations. The major difference between my usual recipe and Abbey's is the amount of heavy cream. I usually use about 2 to 4 ounces heavy cream which adds some mellow richness to the cheesecake. Abbey's recipe uses a full 8 ounces. Oh my, how decadent! Not that I'm complaining. If you're going to make cheesecake, might as well make the richest, creamiest one you can. Many people love cheesecake, but I am not one of them. Most of the time it's too tangy-sour-cheesy for me. Even so, I've baked a lot of cheesecakes in my lifetime and people are always impressed by homemade cheesecake. Cheesecake is not as hard as people imagine it is to make, but let's keep that little secret between you and me. Since I'm not a fan of cheesecake, I prefer batters with flavors that downplay that cream-cheesiness. I know that defeats the purpose of a cheesecake. One of my favorite flavors is espresso/coffee. I gave up coffee about a year ago due to health reasons, but I can still have one very teeny-tiny cappuccino every few weeks. Having one is pretty much a special occasion for me. I can tell you the exact details surrounding each one I've had in the last 6 months. Can you tell how much I miss drinking coffee? For my birthday last month my husband asked me what I wanted to do. I said I wanted to go to the Blue Bottle Café at the Mint Plaza and share a cappuccino. Hey, what can I say? I'm a cheap date. Anyway, like I was saying, espresso cheesecake sounded really good. I didn’t want to do a graham cracker, cookie, shortbread or pastry crust, so I decided to make a chocolate brownie for my crust using a recipe from Tish Boyle's "The Cake Book". The brownie bottom was a perfect complement to the espresso bean flecked cafe latte filling. The bottom layer was like a really moist and fudgy brownie and the filling layer was extremely smooth and creamy. It must be from all that heavy cream. That Abbey really knows her stuff. Thanks to hostess Jenny for sharing this great recipe. So there you have it. Another DB challenge under my belt - that makes 24 and counting. I can't wait to see what's in store for next month. The April 2009 challenge is hosted by Jenny from Jenny Bakes. She has chosen Abbey's Infamous Cheesecake as the challenge. Please visit Jenny Bakes to see the original recipe for Abbey's infamous cheesecake. 1. Preheat the oven to 325F. Lightly butter the bottom and sides of a 10x3 inch springform pan. Line the bottom with a circle of parchment paper and butter the parchment. Cut two or three 18-inch squares of heavy duty aluminum foil and wrap the foil around the outside of the pan. 2. In a double boiler, heat the chocolate and butter until just melted. Add the espresso powder, vanilla and salt, Whisk in the sugar until well combined. Whisk in the eggs, one at a time, whisking well after each addition. Stir in the flour until just incorporated. 3. Scrape batter in the prepared pan and smooth the batter into an even layer. Bake the brownie for 25 to 30 minutes until a tester inserted in the middle comes out with a few moist crumbs. Place the pan on a cooling rack while you make the filling. Increase oven temperature to 350F. 1. Combine cream cheese and sugar in the bowl of a stand mixer and cream together until smooth. Add eggs, one at a time, beating well after each addition, scraping down the bowl in between each egg. Add heavy cream, vanilla extract, espresso powder mixture, ground espresso beans and blend until smooth and creamy. Don’t overbeat. 3. Bake at 350F for 45 to 55 minutes, until the edges are set and the center is still a little wobbly. You don't want the cheesecake to be completely firm at this stage. Close the oven door, turn the heat off, and let the cheesecake rest in the cooling oven for one hour. This lets the cake finish cooking and cool down gently enough so that it won't crack on the top. 4. After one hour, remove cheesecake from oven and lift carefully out of water bath. Let it finish cooling on the counter (about 2 hours), and then cover and chill in the refrigerator. Chilling it for at least 4 hours before cutting is important. Otherwise the cheesecake won't be completely set and might be runny when you cut into it. Run a thin bladed knife along the sides to loosen the cake from the pan. Undo the latch of the springform and remove the ring. Run a thin blade or spatula underneath the parchment paper to loosen the cheesecake from the bottom of the springform pan. I like to use an icing spatula for this. Now place a piece of parchment on top of the cheesecake and then place a plate on top of the parchment so that the cheesecake is sandwiched between the cake pan bottom and the parchment-plate. Invert. Remove the cake pan bottom and gently peel away the parchment from the brownie. Place your serving platter on the brownie and re-invert so that the cheesecake is right side up. Remove the plate and parchment from the top. Yum, looks amazing! I love the idea of a brownie crust, and it sounds great with espresso. The brownie crust sure looks divine. What a gorgeous choice of flavors! Your cheesecake looks perfect! It looks awesome, Mary! I love the brownie crust... now that's decadent! Oh yea Mary! I'm all over a cheesecake that has a brownie for a crust and espresso in my cheesecake. brownie crust! Yum!! your cake looks so smooth and lovely. Bet the the espresso tastes great too! 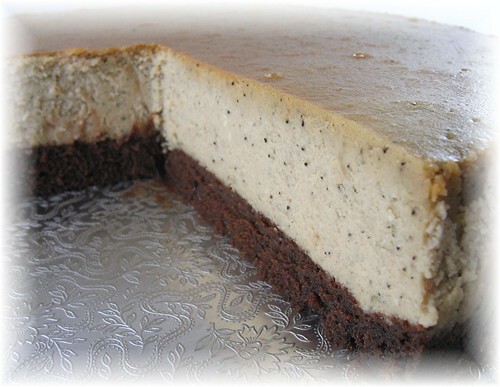 The brownie crust sounds great and is a perfect match for the espresso cheesecake. This looks absolutely delicious! I bake on the foggiest side too! Looks absolutely wonderful - especially that thick brownie crust. Your cheesecake looks so yummy! I love the speckles of espresso in it. Wow great crust idea, your cheesecake looks heavenly! i love the flavor! and the crust - yum! Your cheesecake looks and sounds SO GOOOD! That brownie crust is calling to me! Excellent job!! Love the brownie crust! Nice job! Belated Happy Birthday, I hope you enjoyed your coffee! I love the brownie crust, had a similar thought for my own. Chocolate brownie crust and cheesecake with expresso coffee - how wonderful! It's very sophisticated. Sorry to hear that you cannot enjoy coffee as much as you may like. I think this sounds like a nice treat with a rich coffee flavor for you to enjoy! Great job! Nicely done, Mary! I love the brownie base from Tish's book, too! Wow...looks great! You really did a wonderful job on getting the layers just perfect and textures just right. Lovely! I had to give up coffee a few years ago and can completely relate to caffeine memories. Has your personality changed? I thought I was an extrovert, but it was just the caffeine, heh. Anyway, I love your take on this month's challenge. The crust has always been my least favorite part of cheesecake, and a brownie would just do the trick. I love that your recipe was so close! Sorry to hear you're not a big cheesecake fan. Great way to downplay the cheesecakiness for non-lovers! Brownie crust - now that's just brilliant. And I believe that coffee belongs in everything. Beautiful job! Oh my, that is beautiful! And the brownie crust? Oh yeah! I know I could be happy in this cheese cake. Need to check out this brownie recipe. This cheesecake certainly does look creamier than most! I love the beautiful color... I bet this tastes lovely. Reading your post made me wish SERIOUSLY that I had done a coffee flavored cheesecake. Delish! I love what you did with the challenge, the brownie crust & espresso...wow! Wish I were there...sheer indulgence & perfect!! 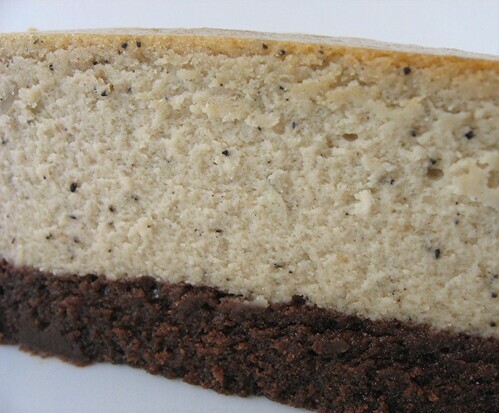 such a nice cheesecake--beautiful texture, and perfect flavor combo! Oh yes! Espresso cheesecake! Fabulous Mary! Hi,I found your site through blogger and LOVED your version of this cheesecake that you prepared for Jenny’s challenge! The brownie crust (and especially the bitter sweet chocolate selection) sounds so delicious! Honestly, chocolate goes well with anything! Thank you for sharing. If you are looking for more ways to include chocolate in your cooking, go to the Dove Chocolate Discoveries webpage for great recipes and ideas. 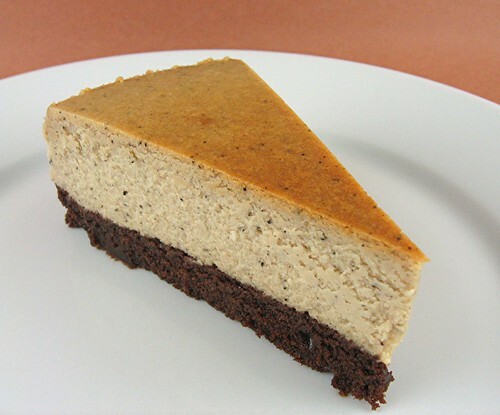 brownie and espresso cheesecake.. that's to die for! So sorry you have to give up coffee. Coming from a coffee addict, I know how terrible that must feel. awesome! I really like the use of espresso powder in baking, and lately I have been substituting it with fresh espresso from my machine, http://www.thecoffeebump.com/la-pavoni-europiccola-espresso-chrome.html. I will definitely try this! What a stylish cake! Espresso filling sounds just perfect. Oh, wow. That is just gorgeous! This cake looks absolutely amazing. I'm going to try it this weekend! This cake is so tasty. My father is a huge fan of creamiest cheesecake and I always try to bake one for him whenever we see my parents. He has yet to be fully blown away by any of the recipes i've tried. Simplicity is key, and yours looks perfect! Can't wait to try it.